I'm not sure yet, but I think maybe I got my groove back. I was watching Anthony Bourdain the other night. (I love his show, even though he regularly jeers at vegetarians.) He was in Sardinia, and the people featured in this episode were simple country folks, doing things the way they'd been done there for centuries. Everyone worked hard, and being a food/travel show, everyone had a hand in the preparation of the food. Someone made the cheese, someone else made the wine. There were ancient looking cooks in the giant communal kitchens, making the same dishes they'd made all their lives, dishes passed down through many generations. And the flat bread that came from the wood fired oven was as beautiful and practical as it has been since it was first made for the sheep herders to carry with them for months at a time while tending the flocks. I started thinking... Maybe, like the cheese maker and the baker and the old cook in the family kitchen, I have been given the job of beadmaker, and it just won't do to shirk that responsibility. Maybe I've been given this skill and this talent for the good of the whole in some way. Maybe it matters on some level that the particular beads I make find their way into the world. Maybe the job of beadmaking is some sort of Divine Assignment, every bit as important as making sure the shepherds have their bread. I planned to spend an hour or two in the studio yesterday, just to see if I could still make a decent bead. I ended up staying glued to that wobbly little stool all morning, all afternoon, and almost into cocktail time. Bead after bead seemed to form themselves in the flame with no effort on my part. I was actually kind of surprised to see all those mandrels sticking out the kiln door. I did it. I made a good batch of beads. I've been thinking I was finished with all that, but it seems I'm not. I am a beadmaker. It's not only what I do, but a big part of who I am. Maybe I'll get paid for them, and maybe I won't. Right now I really don't care. The beads I make are my gift to the Universe, and I trust that in return, I will have what I need. Thanks Anthony, from one of your biggest vegetarian fans. I'd like to give you a bead. Just tell me where to send it. Don't underestimate the value of going off on a tangent now and then. You're not being a spoiled baby for wanting change. Your experiences will add to the flavor of your work. I think its important for all artists to get new perspective. I, however, haven't figured out how becoming a nurse will change my art. I guess I'll find out. Can't wait to see the new beads! 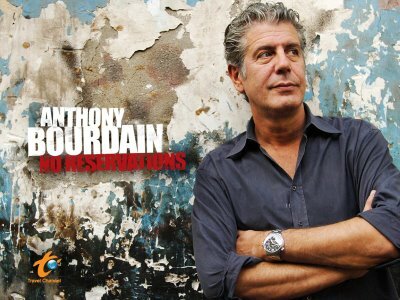 Anthony Bourdain, I also watch him Kim and have been moved to understanding myself better with his words. I am glad that his words gave you courage to go forward with your art. I think of things this way. The Creator has give me a gift, what right do I have to hide that gift from the universe. It is given to be shared and loved by all. Honey we all love your work and I for one would be deeply saddened if you were to give it up. Taking a break periodically is natural and is a way to be juiced up again to create more.